There’s no indulgence better than sinking one’s teeth into a cheesy, topping-rich and delicious slice of pizza or into a big, juicy burger. 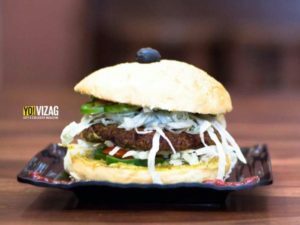 With many options to offer, we get you the best palate pleasers from some of the choicest pizza and burger hotspots around Vizag. Combine the indulgence of luxuriating at the Park Hotel with dipping into the experience of an authentic pizza. Aqua makes the original flavours come alive through its stone oven and wooden fire, taking you as close as possible to the Italian experience as possible. Recommended options for vegetarian lovers are the Mozzarella and Basil pizza renders which combine basil leaves, tomatoes, napolitaine sauce and mozzarella cheese. Try out the Salami and Pepperoni Pizza to taste the Italian blend of flavors and sauces in a 6 sliced pizza. A treat for all the non-vegetarians out there, this one comes with mouth-watering lamb pepperoni, salami and mozzarella cheese toppings. The pizzas served at the Square are just the perfect treat. Crafted with a splendid mix of green vegetables, chopped garlic, tomato spread, broccoli, basil leaves, zucchini and lots of mozzarella on the thin crust base of the Verdure Pizza makes for a mouthwatering option for vegetarians. 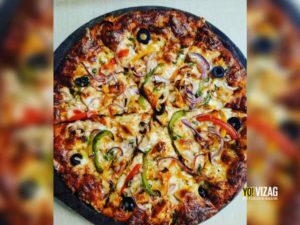 The BBQ Chicken Pizza with its exotic tastes blends the flavourful barbequed chicken with jalapenos, tomatoes, and is loaded with two delicious layers of mozzarella cheese. The favourite Italian food place for many in Vizag, FSM, opposite the Waltair Club, is an integral part of Vizag’s foodie scene. The space brings to its delightful menu many pizza options as well. Not to miss here, is the Sovrano pizza for vegetarians, which brings together Napoli sauce with the spiced up ingredients of sun-dried tomatoes, spinach, jalapenos, mozzarella, olives, pickled onions and roasted bell peppers, on the soft bed of a thin crust pizza base. For all the non-vegetarian lovers, to justify your hunger pangs is the Arcevia Pizza, that’s fully loaded with roast chicken, mozzarella, bacon and spicy pork salami topped with the spicy Napoli sauce. 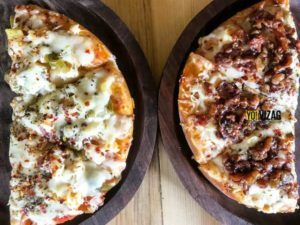 One of the oldest hotspots and favourite places for those in Vizag, the offerings of typical desi style pizzas at the outlet in Siripuram are simply delicious. 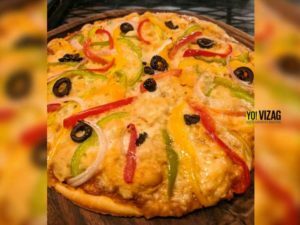 Starting with the homemade crust, the Classic Chilly Chicken Pizza is loaded with finely shredded cheese, onions, fresh tomatoes, capsicum and chicken cooked in Chinese style. Paneer temptation in the Vegetarian category is a foodie-favourite and is loaded with spiced paneer cubes, grated cheese, onion rings and capsicum. Set in the quiet bylanes of Siripuram, Plot 17 has gained popularity for more reasons than one. 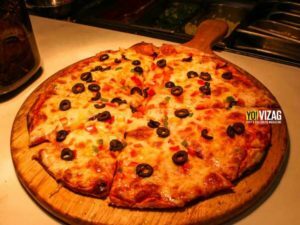 With appetizing selections of pizzas as well, here are some crowd pleasers at this place. 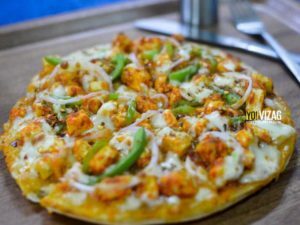 Pizza lovers must try the butter chicken pizza with gravy that comes much recommended. It brings together the perfect blend of cheese, spices and toppings, making it a favoured choice here. Vegetarian-lovers don’t despair, for the Piri Piri sweet corn pizza is a scrumptious option just for you. On the busy streets of the MVP Double Road, this completely vegetarian place has gained the love of many over time. It’s only here that you can get a 20 inch, thin crust pizza. One can taste two different flavours for the same pizza too! A perfect indulgence for all the green vegetable lovers is the Spinaci Pizza that is all about health. This has luscious toppings that include flavorful Italian herbs, onion, spinach, mozzarella cheese and the spice keeper, tomato sauce. Cheese lovers must try the Joey’s Tres Formaggio with its three layers of different kinds of cheese with their special tomato spread to complement the toppings. 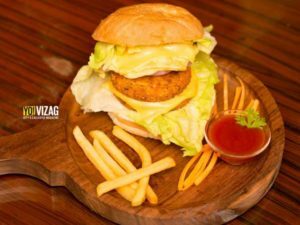 Conceptualised over a garage theme, this destination by the Beach Road in Vizag, brings some creative food options to the table. 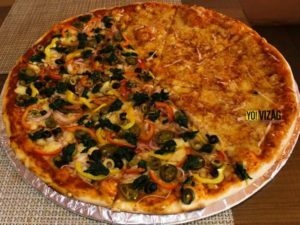 Integrating Andhra’s favorite Gongura into the Italian variety, the eight inch delight of the Gongura chicken pizza has vegetables, bell peppers, capsicum, onions and a tangy spread of gongura chicken which make it a flavoursome option. Vegetarians must try the Lebanese pizza with crunchy crust and health-friendly toppings of hummus, olive oil, eggplant and jalapeños which come served with cheese crumble. A cosy restaurant done up in shades of teal and cream opposite the Waltair Club is a place of choice for many. With many food options, the pizzas here bring the goodness of variety and health on a plate. 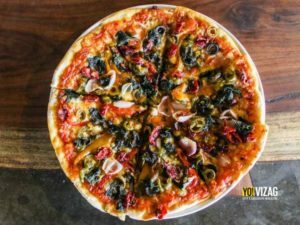 The lip smacking Green Day ranks up on the in-demand list and lets you pick your toppings from the choice of olives, sundried tomato, jalapeno, broccoli, bell peppers, mushroom, spinach, garlic and gherkins. Ranging from their sauces to the thin crust pizza base, everything is freshly made and served. 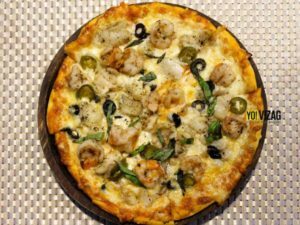 The Gourmet Seafood Pizza comes recommended for the non-vegetarians, and is made using two types of sea food, fish and prawns, that complement each other amazingly well. 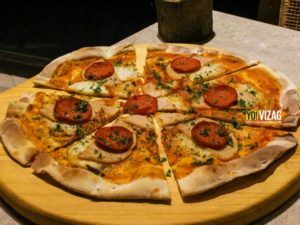 Their unique offering is the six-in-one pizza, where each slice is filled with different and flavourful blend of sauces. It can also be customised with a mix of vegetarian and non-vegetarian toppings as per the customer’s choice. While the Bacon variety is an appetizing choice for the non vegetarians, the vegetarians must try the Pineapple and jalapeno varieties with cheese. 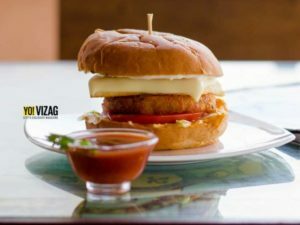 A juicy handmade chicken patty comes with a slice of cheese, capsicum, onions and various dressings that leave you with a wonderful after-taste. 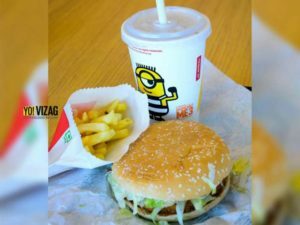 Unlike any vegetarian burger you’ve had, here the patty is made from a mixture of ground chickpeas along with their chef’s secret sauce. A deliciously soft and fresh paneer patty is topped with crunchy lettuce, onions, capsicum, juicy tomato and creamy cheese. 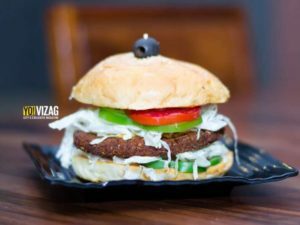 A luscious chicken patty, a fried egg, crunchy lettuce, tomato, onions and capsicum make this a delicious power-house, that comes with yummy fries on the side. 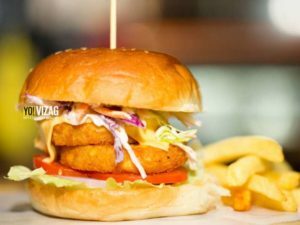 With double hash browns topped with a generous amount of cheese and coleslaw, the hash brown burger is sure to make you drool over it. Combined with mustard mayo spread buns, this one is a runaway winner. A four-layered ‘king sized’ beast that is stuffed with fries and coleslaw, and also features a fried egg on top. Soft fresh buns served with a crispy potato patty along with mayonnaise and cut lettuce is a great option to kill hunger. 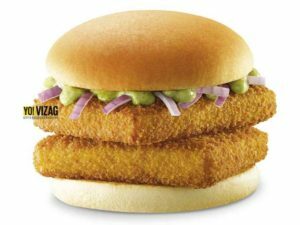 This burger is made with really tender and juicy chicken. 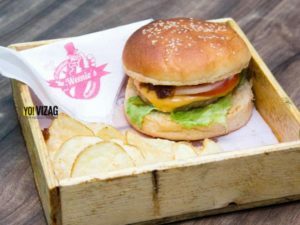 It’s a unique amalgamation of a fiery patty and some real Indian spices. These explosive flavours are sure to bowl you over.